Sesame is a beautiful plant with dark green foliage and pale pink or white, tube-shaped blooms. Sesame seeds are harvested from dried seed pods in late summer or early fall. Although sesame is a relatively hardy plant, it can be bugged by a number of insect pests. 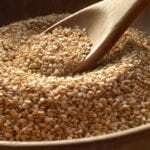 Read on to learn about pests of sesame. We will also provide tips on how to cope with sesame pest problems in the garden. Aphids, leafhoppers and thrips: Aphids, leafhoppers and thrips are common pests of sesame. All three are sucking pests that tend to cause stunted growth and may injure buds, thus preventing development of seedpods. When it comes to managing these small insects, sesame seed pest control is fairly easy to attain with insecticidal soap spray. However, you may need to spray several times if the infestation is severe. You can also spray infested plants with neem oil, which will smother pests of sesame. Leaf roller, cutworms and other caterpillars: Remove damaged growth. Remove the pests by hand and drop them into a bucket of soapy water. Check the sesame plants closely at least once every week. Alternatively, treat leafrollers, cutworms and other caterpillars with Bt (Bacillus thuringiensis), a naturally occurring bacteria that kills the cell membranes in the stomach and digestive tract. However, Bt won’t harm birds or beneficial insects. The best method of sesame pest management is to maintain the best possible growing conditions. Healthy sesame plants are always more resistant to sesame pest problems. Maintain healthy, well-drained soil. Sesame plants that grow in poor soil lack nutrition and are more susceptible to pests. Water wisely. Sesame prefers dry conditions and won’t tolerate soggy, poorly drained soil. Occasional light, fast irrigations are beneficial during extended dry periods. Avoid drip irrigation. Apply a balanced, slow-release fertilizer at planting time. If plants look pale green and unhealthy, side-dress the plants with a nitrogen-bearing fertilizer. Keep weeds in check, as sesame doesn’t compete well with weeds. Additionally, many noxious weeds serve as hosts for aphids and other pests. Keep the garden clean. Sanitation is especially important at the end of the season and in early spring when pests may lie dormant in leaves and other debris.